Israeli soldiers abused a Palestinian minor from Jenin city on Sunday morning. Local sources said the Israeli occupation forces (IOF) manning al-Jalameh military barrier to the north of the city assaulted the 17-year-old boy Mohammad Fawaz Zakarneh. 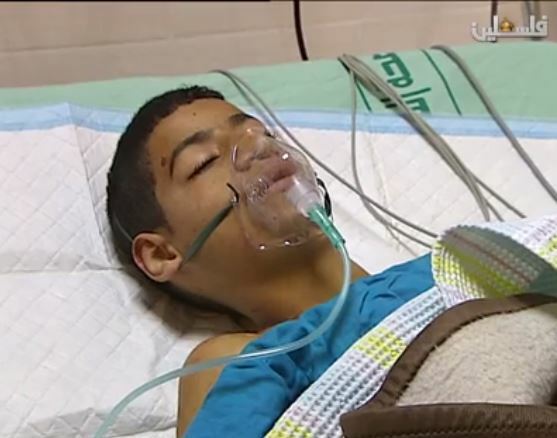 Mohammad is now suffering bruises resulting from the IOF brutal attack. The sources noted that a lot of Israeli assaults have recently been carried out at al-Jalameh military checkpoint that caused injuries to many Palestinians. 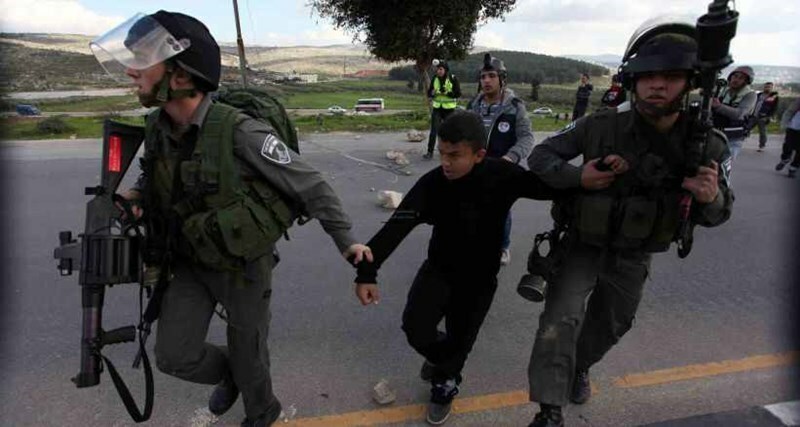 The IOF soldiers detained the boy for two hours before they released him when they found out that he suffers from mental disorders, the sources concluded. Clashes took place, Sunday, near the al-Jalazoun refugee camp, and Silwad town, in the central West Bank district of Ramallah, after dozens of soldiers invaded the area, and surrounded it, before trying to ambush local youths who hurled stones at them, and managed to detonate an explosive near the soldiers. The Palestine TV said some youths, in the al-Jalazoun, managed to reach close to two Israeli soldiers, before a protester hurled a homemade explosive at them. The soldiers then ran away to different direction, while a stone, hurled by a local youth, struck one soldiers in his left arm. Army sharpshooters then took positions and fired rounds of live ammunition, wounding several Palestinians who were moved to the Palestine Medical Center in Ramallah. The wounded Palestinians suffered moderate-to-severe injuries, in their upper body parts. A local doctor said one of the wounded suffered a very serious injury after being shot in the upper-right part of his chest, and was instantly moved to surgery, before being transferred to the Intensive Care Unit. 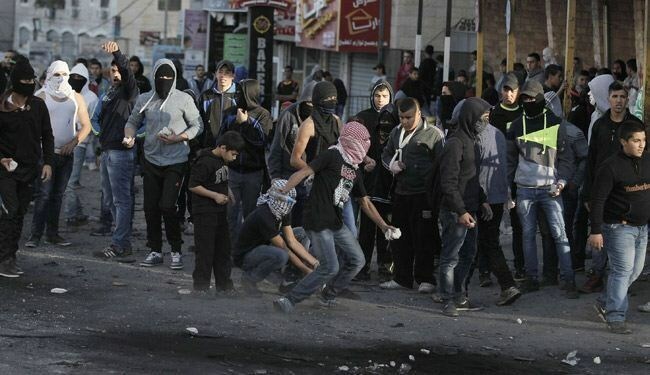 In Silwad, clashes also took place between dozens of local youths and invading Israeli soldiers, before the youths managed to surround three soldiers near some homes, after the soldiers invaded them. After three hours of clashes, two more soldiers tried to reach the home, but were met by dozens of protesters, and ran away dropping some gas bombs while trying to escape. The youths then hurled the gas bombs on the soldiers, forcing them to retreat to a greater distance. The clashes lasted for more than three hours, before more soldiers arrived at the scene, and secured the retreat of the soldiers. Israeli undercover officers afternoon Saturday kidnapped five Palestinians from Jerusalem’s neighborhood of Wadi al-Jouz, where at least some six more Palestinians sustained rubber bullet wounds. Lawyer Mohamed Mahmoud, from Ad-Dameer association said the Israeli occupation officers abducted the five Palestinian citizens from Jerusalem’s Wadi al-Jouz quarter and dragged them to a detention center pending interrogation. Meanwhile, six Palestinian teens sustained rubber bullet wounds in al-Dhuhr area and its environs during the clashes that rocked Wadi al-Jouz. A PIC correspondent quoted eye-witnesses as reporting that the Israeli occupation soldiers targeted the Palestinian civilian youths with randomly-shot volleys of tear gas and rubber bullets. By-standers at the scene said clashes boiled over after a horde of Israeli settlers broke into al-Tur neighborhood in Occupied Jerusalem. In another development, members of the al-Aqsa supervision staff managed to foil a desecration break-in planned by a disguised female Israeli settler. In a separate incident, the Israeli occupation police apprehended the Jerusalemite cameraman Mustapha al-Kharouf from the yards of holy al-Aqsa Mosque and transferred him to a nearby detention center pending investigation. The photojournalist was released a few hours later. Palestinian medical sources have reported that an elderly man was injured, on Saturday evening, after a number of Israeli extremists assaulted him as he was leaving the Al-Aqsa Mosque, in occupied Jerusalem. The sources said the man, Ahmad Mahmoud al-Qaq, 64 years of age, suffered various cuts and bruises, including under his right eye. Eyewitnesses said the man was leaving the mosque after performing evening prayers when a number of Israeli extremists approached him, and started beating him, before local worshipers saw the attack and intervened. In related news, a number of Israelis from the illegal colony of Beit Eyin, built on Palestinian lands near Beit Ummar, north of the southern West Bank city of Hebron, attacked on Saturday afternoon, a farmer and his children while working on their land. Mohammad Abdul-Hamid Sleibi and his children were in their own land, near the illegal colony, in the Abu ar-Reesh area. 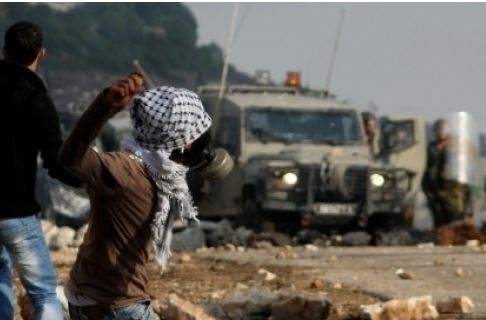 Mohammad ‘Ayyad ‘Awad, spokesperson of the Popular Committee against the Wall and Settlements in Beit Ummar, said five masked settlers hurled stones, using slings, at the farmer and his family, forcing them out of their land. ‘Awad said Sleibi recently managed to obtain an Israeli court ruling allowing him to build a wall around his land due to ongoing attacks. As hundreds of Palestinian women peacefully marched near the Qalandia Terminal north of occupied Jerusalem, Israeli soldiers violently attacked them, and wounded nine. The protesters marched towards the soldiers, close to the terminal, before the army started firing gas bombs and concussion grenades. The Palestinian women were holding a nonviolent protest, marking March 8, the International Women’s Day. 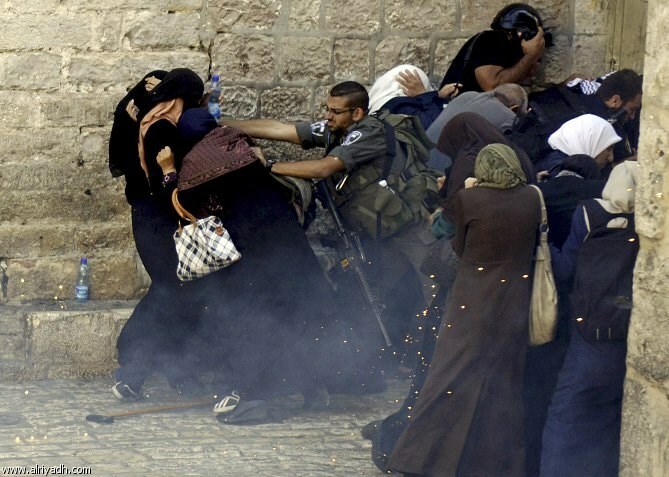 Medical sources said nine women suffered the effects of tear gas inhalation, and received treatment by Palestinian medics. Following the attack, a number of local youths hurled stones and empty bottles on the soldiers who fired rubber-coated metal bullets, in addition to gas bombs and concussion grenades. In related news, soldiers kidnapped late on Saturday at night and earlier Sunday, at least seven Palestinians, including a mentally challenged 17-year-old, identified as Mahmoud Fayez Zakarna. Zakarna was held for several hours at the al-Jalama roadblock, and was repeatedly beaten by the soldiers, before they released him. The army said the arrests were focused in Borqa and Birzeit, near Ramallah, in addition to Doura and the ath-Thaheriyya, south of Hebron, and that one of the kidnapped is a Hamas member; all were taken to an unknown destination. A number of Palestinian ladies choked on tear gas on Saturday after the Israeli occupation forces (IOF) violently disbanded a peaceful feminist demo near the Qalandiya military checkpoint, south of the West Bank city of Ramallah. The IOF attacked a feminist rally staged near the Qalandiya checkpoint, separating the West Bank from Occupied Jerusalem, to mark the International Women's Day and in protest at Israel`s violation of Palestinian women's rights. Eye-witnesses said the IOF troops deployed at the Qalandiya checkpoint targeted the civilian marchers with randomly shot-barrages of tear gas canisters, resulting in nine suffocation cases among the female protesters. Clashes burst out after a group of Palestinian male rally-goers hurled stones at the IOF soldiers in response to the attack launched on the unarmed ladies. 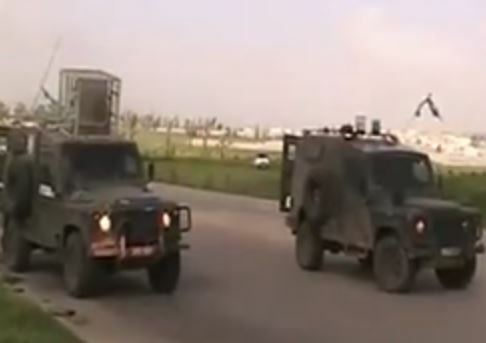 The IOF troops reportedly summoned reinforcements in the process. A similar attack cropped up in al-Khalil`s town of Yatta as the IOF attempted to disperse a non-violent anti-settlement march. A PIC correspondent quoted the popular activist Rateb al-Jabour as reporting that he was rushed to a local clinic to receive treatment for the wounds and bruises he sustained in the attack. A number of demonstrators were treated for light injuries in the process after the IOF heavily beat them up. The IOF further attacked a peaceful rally in al-Khalil calling for opening the passageway between Sourif and al Jab'a villages. The protesters were physically assaulted by the IOF as they pushed their way through an iron gate separating the two villages for the past 14 years to protect the illegal Jewish settlers, activist Youssef Abu Maria reported. A number of rally-goers were transferred to the hospital to be treated for the inflicted wounds. 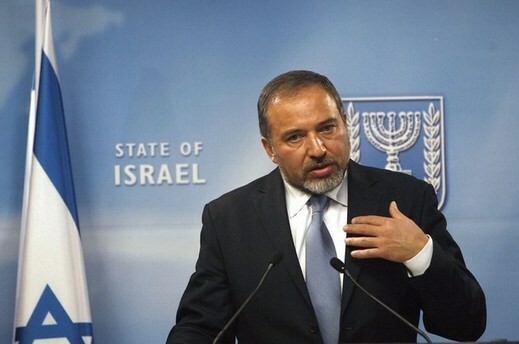 Israeli Foreign Minister Avigdor Lieberman renewed his call for the execution of Palestinians who carry out resistance attacks against the Israeli occupation. Lieberman was commenting Friday on the Jerusalem attack in which a Palestinian driver ran over a number of Israeli conscripts in Occupied Jerusalem. The resistance operation resulted in the injury of six Israeli soldiers, according to Israeli policemen who immediately shot and seriously wounded the Palestinian man. The Israeli Occupation Forces (IOF) deliberately shoot to kill the Palestinians who conduct such actions as evident in similar previous attacks. For his part, Hamas spokesman abroad Hosam Badran stressed the Palestinians’ right of resistance. He opined that the run over operation demonstrates the insistence of the Palestinian people on the resistance option. The Hamas spokesman told Quds Press that the “heroic operation” is a clear message to the world that the Palestinians have the right to respond to Israeli crimes including desecration of the Aqsa Mosque, the continuation of settlement in the West Bank, and the siege on the Gaza Strip. Regarding to the Palestinian Central Council (PCC) decision of ending the security coordination with the Israeli occupation, Badran said “we look positively at the decision, whilst the actual implementation is the only indication for its seriousness”. He pointed out that the first step towards the enforcement of the PCC decision should include releasing all of the political detainees from the Palestinian Authority jails as well as halting the arrests and summonses on political grounds. 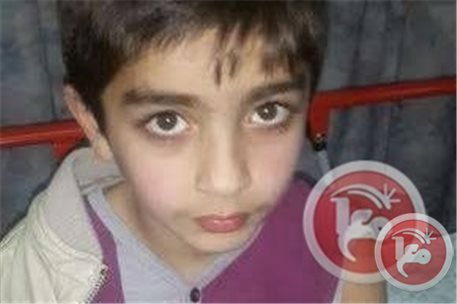 Seven-year-old Anas Yahya Abdeen was reportedly shot with a rubber-coated bullet by Israeli soldiers on Friday evening in his house in the Ras al-Amud neighborhood east of the Old City of Jerusalem. According to his father, the boy was hit after Israeli troops stormed the house of Abd al-Razeq al-Salayma who allegedly drove his vehicle into a group of Israeli border police in the Sheikh Jarrah neighborhood earlier on Friday. Anas was standing in the balcony opposite to the house of al-Salayma family when "all of the sudden he started to cry and shout, and we realized later that he was hit by a black rubber-coated bullet in his arm," the father explained. 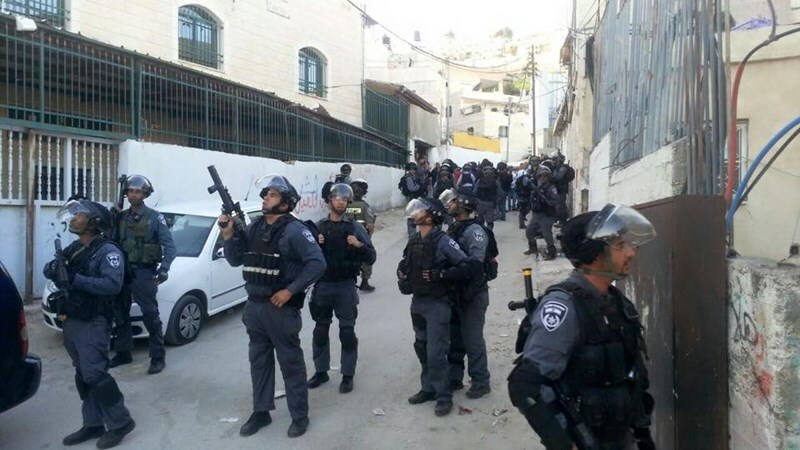 Separately, a young Palestinian man was shot with a rubber-coated bullet in his forehead during clashes in the Ein al-Luza area of the Silwan neighborhood southeast of the Old City, according to Majdi al-Abbasi of the Silwan-based Wadi Hilweh Information Center. He added that clashes broke out in the area between young Palestinian men and Israeli troops, and that Israeli troops arrested a 14-year-old boy Mustafa Baydoun while he was standing outside his house in Baydoun area of Silwan, where clashes also ensued. An Israeli police spokesman did not immediately return a call for information on the incident. 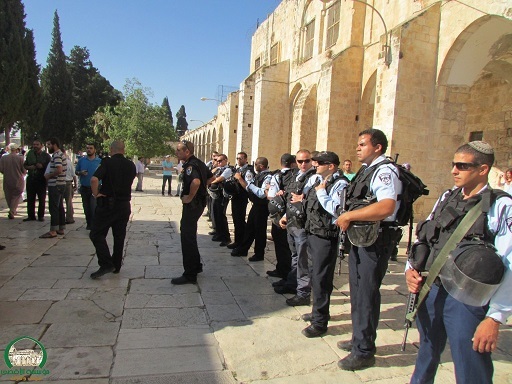 Israeli police spokesman Micky Rosenfeld informed Ma'an of heightened security measures to be taken throughout Jerusalem on Friday, following the alleged attack by al-Salayma. Israeli naval forces shot and killed a Palestinian fisherman, and arrested two others while they were sailing in small fishing boats off the coast south of Gaza City early Saturday morning. Speaker of the union of Gaza fishermen Nizar Ayyash told Ma'an that Israeli gunboats opened machine gun fire at a group of Palestinian fishermen. Health Ministry spokesman Ashraf al-Qidra confirmed to Ma'an that Tawfiq Abu Riyala died from injuries sustained by the fire. Ayyash added that Israeli navy then seized two fishing boats and took them to unknown destination. An Israeli army spokeswoman told Ma'an that after four vessels deviated from the fishing zone this morning, Israeli forces ordered the vessels to halt. Warning shots were fired towards the engines of the vessels, and two hits were confirmed. Two of the vessels were detained by Israeli forces, the other two turning back. The spokeswoman added that every deviation by fishing boats from the fishing zone is perceived by Israeli forces as a security threat, citing an incident last month in which a vessel was caught outside of the fishing zone with arms intended for Hamas. The Aug. 26 ceasefire agreement between Israel and Palestinian militant groups stipulated that Israel would immediately expand the fishing zone off Gaza's coast, allowing fishermen to sail as far as six nautical miles from shore, and would continue to expand the area gradually. Since then, there have been widespread reports that Israeli forces have routinely opened fire at fishermen within those new limits, and the zone has not been expanded. The al-Mezan Center for Human Rights reported that since the ceasefire agreement Israeli forces have detained 49 Palestinian fishermen, injured 17, confiscated 12 fishing boats and damaged fishing tools in nine other incidents. Recent targeting of Gazan fishermen comes at a time when economic growth in the coastal enclave is near frozen and 80 percent of the population is food insecure, according to the Food and Agricultural Organization of the United Nations. Kulanu's Maj. Gen. (res.) Yoav Galant says Israel's next round against Hamas will take place during term of next government due to results of Operation Protective Edge; Yadlin slams Netanyahu's Congress speech. Maj. Gen. (res.) Yoav Galant harshly criticized the conduct of the Netanyahu government on its handling of Operation Protective Edge this past summer, and said it failed to take proper action against the tunnels built by Hamas over recent years. The Kulanu party candidate, who was speaking at a cultural event in Be'er Sheva on Saturday, said: "The government knows about the tunnels, as does the defense minister, and they don't take care of it; this is unacceptable. Thirty-something tunnels are not dug in a day…the State of Israel allowed 30 tunnels to be dug leading to preschools, and I find that unacceptable." Galant stated that Israel's next round against Hamas will occur during the term of the next government due to the results of Operation Protective Edge. He claimed that the government is essentially throwing sand in the eyes of the public regarding the situation in the Gaza Strip. "The public is presented either with a long, expensive and low-quality war in terms of results, or with rivers of blood. "Operation Protective Edge was a 50 day-long war," he continued, saying, "When I was (the chief commander) in charge of Operation Cast Lead, it took us less than half of time, and we didn't have the Iron Dome. 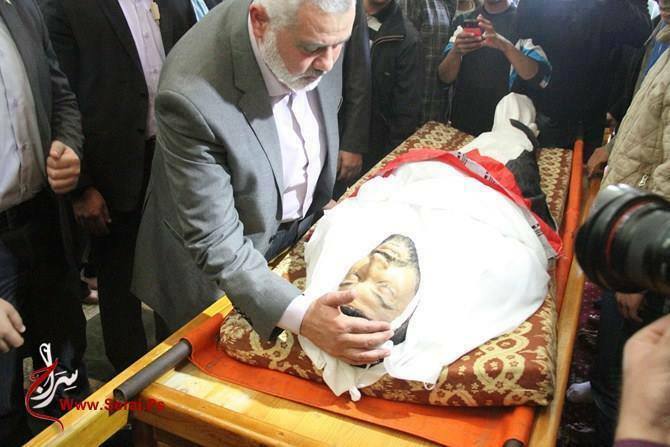 We made Hamas fight against soldiers, not citizens." The number two candidate on Moshe Kahlon's Kulanu list added that Israel's security situation would have enjoyed a state of calm if he had been permitted to finish what he had been tasked with during Operation Cast Lead. "The public needs to choose who will conduct the next round. Will it be the person who knew how to gain a victory in the past and will do the same in the future, or the one who gained a draw? Former IDF general and Zionist Camp candidate for the defense ministry Amos Yadlin also spoke at the event, and criticized Prime Minister Benjamin Netanyahu's speech to a joint meeting of Congress last week. He stressed that Israel does not face an existential threat, saying: "Netanyahu excels at giving speeches, but fails to act. He said that he would be strong against Hamas – we saw what happened last summer. He released terrorists with blood on their hands who murdered Jews." Yadlin added that one could not compare the situation today to the Holocaust: "We have a country, an army and the US as an ally. Different methods should be employed to stop Iran." Referring to Netanyahu's speech once again, he stated that "AIPAC was not happy with the move. It wasn't a smart one. It was done for the benefit of internal politics." Commenting on Israel's latest military operation in Gaza, Yadlin said: "Netanyahu promised to be strong against Hamas and we saw what happened with them last summer. He wrote a book on the war against terror and against releasing murderers, and released hundreds of those." The Zionist Camp candidate added that "under (Netanyahu's) watch, Iran became a threshold nuclear state." 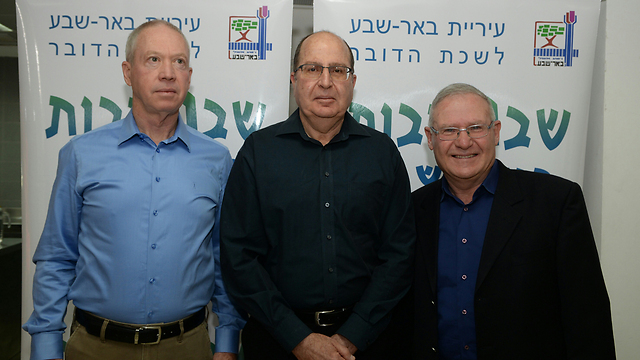 Defense Minister Moshe Ya'alon (Likud) also appeared at the event, and addressed the criticism from Yadlin and Galant regarding Operation Protective Edge. "Security is a complex issue. It's not a topic for slogans. War is not a child's play. Military force is used as a last resort and when there is no choice," he said. "The use of military force has a price. A defense minister does not only look at things through a rifle sight. One must think before acting. "Those who only view things through a rifle sight apparently do not understand the consequences of a military operation on the country and the international arena….We conducted the operation with responsibility and proper judgment. The results aren't measured by the extent of destruction, but by how long the truce holds," Ya'alon claimed. Israeli navy boats opened fire, on Saturday at dawn, at Palestinian fishing boats in Gaza territorial waters, moderately wounding one fisher, and kidnapped two others. Ziad ‘Ayyash, head of the Palestinian Fishermen Syndicate, said resident Tawfiq Abu Ryala, 25, was shot in the abdomen, while Jihad and Wahid Sayyed Kaskin, were kidnapped. ‘Ayyash added that the navy confiscated the three Palestinians’ boat, and also attacked other boats before forcing the fishers back to shore. The navy attacks Palestinian fishers and their boats nearly on a daily basis, and frequently conducts arrests and confiscates the boats. 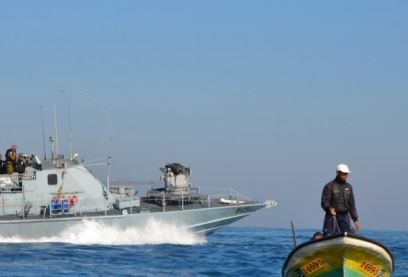 On Thursday morning, the navy, shot and wounded two Palestinian fishermen in Palestinian waters near the Sudaniyya area, northwest of Gaza City, and kidnapped four others. Two more attacks were reported on Tuesday and Monday of this week. All took place while the boats were in Palestinian territorial waters, within the six allotted nautical miles. Israeli Occupation Forces (IOF) fired machineguns on Saturday morning at Palestinian farmers working in their lands to the east of Khan Younis in southern Gaza Strip on Saturday. Israeli naval boats as well opened fire at Palestinian fishing boats with no causalities reported. Local sources told the PIC reporter that IOF soldiers, stationed at the Israeli military security fence, opened machinegun rounds intensively at Palestinian farmers and their agricultural lands in two areas to the east of Khan Younis. The Gazan fishermen also told the PIC reporter that Israeli navy soldiers fired at Palestinian fishing boats off Khan Younis coast, earlier on Saturday, despite fishing within the permitted zone. The IOF continues, by such offences, to breach the ceasefire agreement signed in August, 2014 following 51 days of Israeli brutal aggression on the besieged enclave. Israeli soldiers shot and injured, on Friday at night, two young Palestinian men, after firing rounds of live ammunition on their car, driving near the al-Jalama roadblock, north of the northern West Bank city of Jenin. Medical sources said Mustafa Samir Ballout, 20, from Jenin city, suffered a moderate injury before the soldiers moved him in a military ambulance to an Israeli hospital. The Ballout family denied some reports, on Facebook and by a few agencies, alleging their child was killed, and said he is still receiving treatment in the Israeli Hospital. In addition, resident Yousef Abdullah Abu Na’sa, 18, was shot in the abdomen before local medics moved to Khalil Suleiman Hospital in Jenin. The Israeli Occupation Forces (IOF) opened fire late Friday at a Palestinian vehicle carrying two citizens at Jalama checkpoint to the north of Jenin. Local sources told the PIC reporter that the Palestinian vehicle was subjected to a surprise gun fire attack while passing near Jalama checkpoint. Two young men were injured during the attack. The young man Mustafa Balout, 20, was seriously wounded and transferred to a hospital in 1948 occupied Palestine. The 18-year-old Youssef Abu Naasa was hospitalized in a local hospital in Jenin after being shot and injured in his abdomen. The doctors described his condition as stable. Palestinian medical sources have reported that a child was shot and seriously injured, on Friday evening, and four residents suffered moderate wounds, after Israeli soldiers invaded the al-Jalazoun refugee camp, near Ramallah. Local residents said clashes took place with the soldiers after invading the al-Jalazoun, and that the army fired rounds of live ammunition in addition to rubber-coated metal bullets, and gas bombs. Medical sources said the child, identified as Moath ar-Ramahi, 15 years of age, was shot in the chest by an Israeli army live round, and was moved to a local hospital suffering a serious by stable injury. The sources added that four Palestinians were also shot by the army, and suffered moderate wounds. The Israeli Occupation Forces (IOF) broke into the home of Mohammed Salaymeh, who Friday ran over a group of Israeli conscripts moderately wounding seven of them, in Ras al-Amoud neighborhood in occupied Jerusalem. During the raid, the IOF carried out a violent search and confiscated Salaymeh’s computer and some personal belongings. Family sources told the PIC reporter that all the family members were investigated during the raid and search operation. Salaymeh’s father and brother were arrested and transferred to Maskoubiya detention center, the sources added. Salaymeh has no political affiliation to any faction or movement and was never arrested before, his uncle said. Addameer Foundation lawyer Mohammed Mahmoud stated that Salaymeh was taken to Hadassah Ein Karem Hospital, where he underwent an operation to remove a bullet from his back. He is in constant situation, the lawyer pointed out. The lawyer pointed out that a court session is scheduled to be held on Sunday to extend his detention pending investigation as he is still being held in the hospital for treatment.